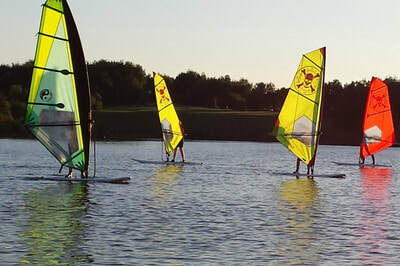 Manvers Waterfront Boat Club has a small but active windsurfing section. We have a good range of windsurfing kit, with modern boards that are easy to learn to sail and also progress to intermediate standards. Our RYA qualified instructors can help you learn the basics, using a simulator on land and appropriate kit on the water. The lake provides a suitable environment to learn on – come and give it a try. Learning to windsurf is a wet experience; we have some club wetsuits available and recommend that you bring some old trainers that you don’t mind getting wet to provide foot protection and grip. If you windsurfed in the past, come and try our modern boards and see how much easier they are to sail than the old kit – it’s never too late to return to the sport. The club has recently bought two Topper Topaz dinghies for use by members. These boats are easy to set up and to sail and are ideal for our lake. We occasionally have the use of an Access dinghy on loan from the RYA and will be looking to buy our own boat and further develop sailability in due course. If you are interested in sailing at Manvers Lake please get in touch.